In TSheets, in the left menu, go to Feature Add-ons > Manage Add-ons. Find QuickBooks Online Integration and click Install. Click Connect to QuickBooks. The Intuit sign-in page displays. Sign in and, if you have multiple companies, select the one to which you want to link. When prompted, click Authorize. A "You are now connected" message displays, and the Preferences window opens. Go to Apps.com, find TSheets Time Tracking, and click Learn more. 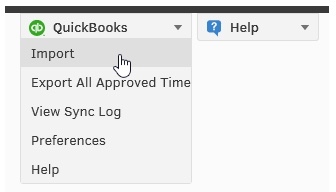 If prompted, in the new tab, sign in to your QuickBooks Online account. If prompted, choose which QuickBooks company you'd like to integrate with TSheets. On the Set up TSheets Time Tracking page, login to an existing account, or start a free trial. In the Preferences window, select the items that you want to import into TSheets from your QuickBooks account. Delete all users: If you've already added employees into TSheets, they would not be linked with your QuickBooks account, so you can choose to archive them upon the first sync. Import Customers and Jobs: This imports all active customers and their jobs into your TSheets account to allow employees to track time against them. You can either assign them to all employees, or assign them individually later (uncheck assign imported Customers and Jobs). Note: If available, the customer's address will also sync in to TSheets for the Nearby Jobs functionality. Show Service Items: Brings your Service Item list over as a list employees can pick from while tracking time. Show Billable: Gives employees an option to indicate whether the time they're tracking is billable or not. Show Class: Brings your Class list over as a list employees can pick from while tracking time. Import Vendors as Employees: If you have Vendors/Contractors that need to track time, you can choose to import them as users into TSheets. Read the warning about items that will be deleted, and if you agree, in the empty box, enter DELETE, and click Next. Under Exporting Time to Quick Books, select the date prior to which timesheets won't be exported to QBO. Additions and changes in QuickBooks will automatically import into TSheets every 5 minutes. The sync log will display (Auto) next to the automatic imports. To restrict the import, go to QuickBooks > Preferences. Under Automatically import changes to, deselect the items you don’t want to automatically import. To disable the automatic import entirely, deselect the Automatically import for changes made in QuickBooks. Note: A manual import can still be performed, if needed. In the upper right corner of TSheets, click QuickBooks > Import. If you'll be using the TSheets + QBO integration for payroll, check the Use QuickBooks Online for payroll box in the QuickBooks Online Integration Preferences. Payroll items, if imported upon first sync, will map automatically to the correct time types (e.g., the Overtime payroll item will be mapped to the Overtime time type), but it is important to double check and make adjustments if needed. See: How to Map QuickBooks Payroll Items.